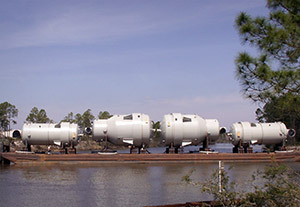 William S Nadler Sugar Process Equipment | William S. Nadler Jr., Inc.
William S. Nadler Jr., Inc. is an equipment supplier to the sugar factories and refineries in the Gulf Coast Region in the United States. We have also supplied equipment and design to sugar industries outside the US in the Caribbean and Central America. Services we provided are backed from our vast knowledge and experience in the sugar industry dating back as far as the late 1800s from Nadler Inc. to today. This expertise in the sugar equipment and design are still seen in many of the Sugar Processing Mills and Refineries running today. William S. Nadler Jr., Inc. can provide a complete specialized equipment design, manufacture and installation of the equipment we offer. In all three of our divisions we can provide our customers from past to present knowledge of sugar machinery and equipment for the sugar processing industry.